This is such a big question, curry! Feedback happens everywhere!! My current primary tools for providing instructive feedback are rubrics and the Suggesting feature in Google Docs, but this post will focus only on rubrics since Google docs seems pretty straight-forward to me. I do offer other types of feedback on low-stakes writing—reading responses and reflection activities, for example—but my intent in this feedback is to be encouraging, supportive, or just to let the students know that I am reading every word they write 🙂 . I think this type of feedback might fall into what Warnock refers to as response–when he distinguishes between response and grading. When/if I am able to teach online, I imagine that I will heavily use Canvas’s recording feature in addition to these tools–both to improve the variety of feedback students receive and to help personalize the online environment. I saved samples of papers I’ve graded over the years. These are the papers that never got returned because students dropped the class or because they disappeared at somepoint during the semester. Writing this blog post, I became curious about how my comments have changed, so I reread my comments on some of these essays. I was struck by how much of my marginalia (Y E S ! I’ve always wanted to use that word in earnest! ), focused on the specific assignment in my early years of teaching. Over the past dozen years, though, I see a shift, and my comments are largely about specific skills. I attribute this shift to when I started to hone my rubrics. 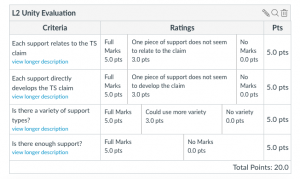 All this might be (actually, I’m sure it is) a long way to get to my focus of this post: optimizing the rubric tool in Canvas to improve not only my feedback but also students’ understanding of my feedback in onsight classes and (hopefully) in online classes. I remember during our fall certification sequence somebody sharing research about how infrequently students actually read our comments—not much 🙁 —and have thought about why this might be ever since. One reason might be that students don’t understand what we mean by the comments. For example, if the comment is that the paragraph lacks development or focus or unity or coherence, I can imagine some of my students not knowing what the heck I am talking about—despite the fact that I feel like I’ve explained these concepts—in overwrought detail—a zillion times. So . 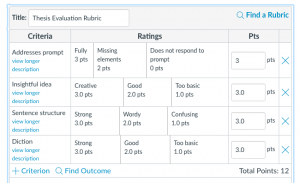 . . here’s my idea for using the rubrics tool in Canvas. I’m considering using them to maximize both peer- and self-evaluations at various drafting stages in order to reinforce student understanding of basic compositional concepts and/or their understanding of specific critical thinking skills. In f2f classes, I’ve been doing versions of the types of evaluations I’m imagining, but with pen and paper and perhaps with not as much clarity of instruction or accountability as might be possible with Canvas. My intent is that these peer- and self-evaluations promote deeper understanding of what sometimes seem to be amorphous concepts like development and unity. I mocked up a few of these rubrics to concretize how I might use each of these rubric types. *These are teaching tools I created to help explain the concept of unity to students. You can check them out here and here. 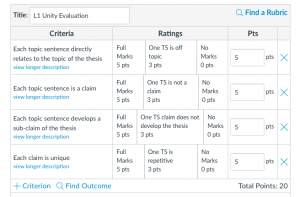 Canvas Questions: To implement these evaluations, I’m guessing that I create an Assignment that requires peer reviews and then attach the corresponding rubric. Does anyone know if this right, or am I missing something? Also, does Canvas have a way for the instructor to grade a student’s comments on a peer review? I tell students that I consider peer reviews as a type of test, an open-book, OK-to-ask-me-questions-during-type-of-test, for which they receive grades based on the quality of their comments and demonstration of understanding the assignment requirements. I know where I can see the student’s peer comments, but I couldn’t figure out if I can grade that student’s comments. This entry was posted in Prompt / Rubrics / Feedback by D. Potratz. Bookmark the permalink.